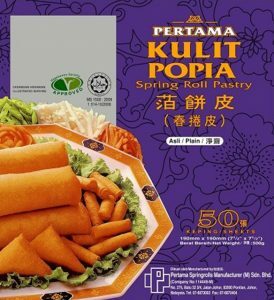 PERTAMA Spring Roll Pastry has been established for more than 30 years. 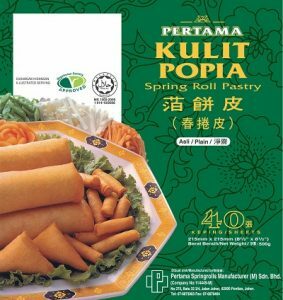 Produced with special formulation for spring roll pastry (popiah skin), our products are well known for its premium distinct quality. PERTAMA Spring Roll Pastry stay fresh and its crispiness last longer after frying. 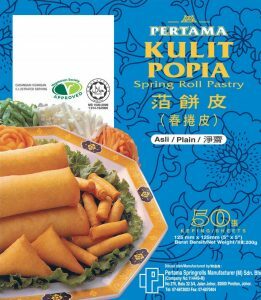 PERTAMA Spring Roll Pastry is suitable for all kind of fillings and you can fry or bake it to enjoy the unique texture. PERTAMA Spring Roll Pastry won the International Prestigious World Branding Award as Brand of The Year Award 2017 in Kensington Palace, London – UK. The recognition from the International organization proved the quality assurance of our spring rolls pastry in the local and international market.